Did anyone see the new Bourdain episode this week? The one where he meets up with Zamir in Russia and they throw back shot after shot of vodka together? Bourdain, who has no reservations (pun intended) about drinking may not just be obliging drinking buddy Zamir. 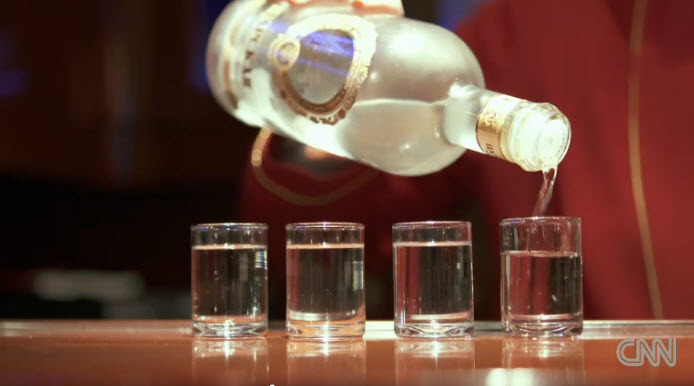 Turns out, it’s very bad etiquette to turn down (or mix) vodka in Russia. Want to know other fascinating etiquette tips that will save you from awkward situations and potentially help you make friends? Check out these 15 international travel etiquette tips from CNN, published by Budget Travel. 1. In Thailand, don’t put food in your mouth with a fork. 2. In Japan, never stick your chopsticks upright in your rice. 3. In the Middle East, India and parts of Africa, don’t eat with your left hand. 4. At a traditional feast in Georgia, it’s rude to sip your wine. 5. In Mexico, never eat tacos with a fork and knife. 6. In Italy, only drink a cappuccino before noon. 7. In Britain, always pass the port to the left — and remember the Bishop of Norwich. 8. In France, don’t eat your bread as an appetizer before the meal. 9. In China, don’t flip the fish. 10. In Italy, don’t ask for parmesan for your pizza — or any other time it’s not explicitly offered. 11. Don’t eat anything, even fries, with your hands at a meal in Chile. 12. In Korea, if an older person offers you a drink, lift your glass to receive it with both hands. 13. Never mix — or turn down — vodka in Russia. 14. When drinking coffee with Bedouins in the Middle East, shake the cup at the end. 15. In Brazil, play your tokens wisely. Read the full article here, for the insightful back story on each of these rules.